The landscaping on your property has a number of features and this includes softscaping, hardscaping, water features, fireplaces, fire pits, retaining walls and more. It’s important that all these elements and features be used in the right proportion to ensure that the garden and yard spaces have a cohesive and balanced appearance. This is why you should hire experienced landscapers to install and maintain your landscape. Anyone that has lawn spaces knows exactly how difficult it is to keep these installations looking spruced-up at all times. The grass gets trampled upon and sees a lot of wear and tear. This can cause it to become bare in patches etc. The one way to keep your lawn looking good and healthy is to get it mowed with regularity. The landscapers that handle landscape maintenance for you will bring special mowers and ensure that these areas are mowed regularly and look well-manicured at all times. Lawn care isn’t just about mowing, and homeowners find that they don’t really have too much time to dedicate to the care of their lawns. When you hire a good company for the job, they will ensure that your lawn gets the attention and care it needs. 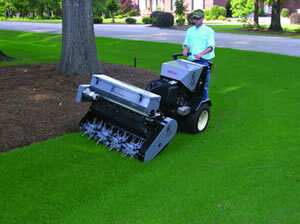 The lawn care plans they design for you will include mowing, aerating, de-weeding, res-sodding or re-seeding and more. The grass will also have to be fertilized with regularity and the pest control will have to be done as well. There are fixed schedules that have to be maintained for all these jobs and a good company will set these properly for you. Maintaining a lawn is not child’s play. The grass has to be mowed with regularity and fertilized as per a set schedule. The weeds have to be removed if and when they show up, and the pest control has to be done at least 3-4 times a year. The soil tends to get compacted over time and aerating it ensures that the roots of the grass get enough oxygen and nutrition. Irrigation and drainage system checks should be conducted as well; that ensures the grass will be watered at fixed schedules and that there will be no pooling of water either on the grass or in any other areas of the landscape. When you have lawn installations, big or small on your property, you need to ensure that they are maintained well. Hiring tree services experts like Damon Johnson ensures you get the kind of solutions you need at lawn care cost that will fit perfectly into your budget.